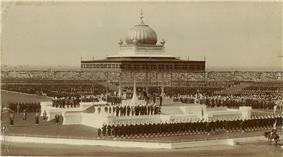 The Delhi Durbar (Mughal term durbar. Called the "Proclamation Durbar", the Durbar of 1877 was held beginning on 1 January 1877 to proclaim Queen Victoria as Empress of India. The 1877 Durbar was largely an official event and not a popular occasion with mass appeal like later durbars in 1903 and 1911. It was attended by the 1st Earl of Lytton—Viceroy of India, maharajas, nawabs and intellectuals. This was the culmination of transfer of control of much of India from the British East India Company to The Crown. The Empress of India Medal to commemorate the Proclamation of the Queen as Empress of India was struck and distributed to honoured guests, and Ramanath Tagore was made a Maharaja by Lord Lytton, viceroy of India. 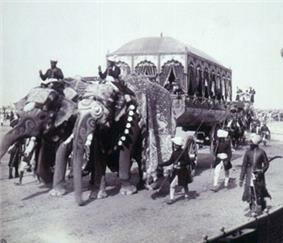 The durbar was held to celebrate the succession of King Edward VII and Queen Alexandra as Emperor and Empress of India. 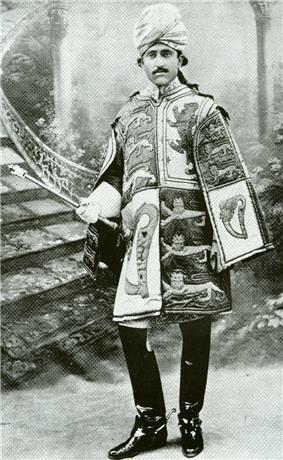 The two full weeks of festivities were devised in meticulous detail by Lord Curzon. It was a dazzling display of pomp, power and split second timing. Neither the earlier Delhi Durbar of 1877, nor the later Durbar held there in 1911, could match the pageantry of Lord Curzon’s 1903 festivities. In a few short months at the end of 1902, a deserted plain was transformed into an elaborate tented city, complete with temporary light railway to bring crowds of spectators out from Delhi, a post office with its own stamp, telephone and telegraphic facilities, a variety of stores, a Police force with specially designed uniform, hospital, magistrate’s court and complex sanitation, drainage and electric light installations. Souvenir guide books were sold and maps of the camping ground distributed. Marketing opportunities were craftily exploited. Special medals were struck, firework displays, exhibitions and glamorous dances held. The India Post issued a set of two commemorative souvenir sheets with special cancellation struck on 1 January 1903 - 12 noon, a much sought after item for the stamp collectors today. On 22 March 1911, a royal proclamation announced that the Durbar would be held in December to commemorate the coronation in Britain a few months earlier of Queen Mary and allow their proclamation as Emperor and Empress of India. Without public forewarning, the announcement of the move of India's capital from Calcutta to Delhi was also made at the Durbar. Practically every ruling prince and nobleman in India, plus thousands of landed gentry and other persons of note, attended to pay obeisance to their sovereigns. 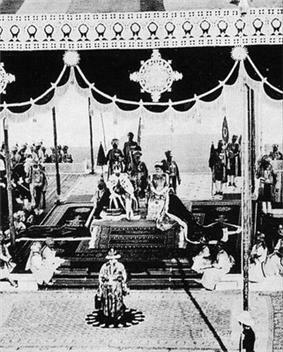 The official ceremonies lasted from 7 December to 16 December, with the Durbar itself occurring on Tuesday, 12 December. The Sovereigns appeared in their Coronation robes, the King-Emperor wearing the Imperial Crown of India with eight arches, containing 6170 exquisitely cut diamonds, and covered with sapphires, emeralds and rubies, with a velvet and miniver cap all weighing 34.05 ounces (965 g). They then appeared at a darshan (a sight) at the jharoka (balcony window) of Red Fort, to receive half a million or more of the common people who had come to greet them. A feature film of the event titled With Our King and Queen Through India (1912) – also known as The Durbar in Delhi – was filmed in the early color process Kinemacolor and released on 2 February 1912. There is a magnificent tiara belonging to the present Queen called the Delhi Durbar Tiara. The necklace was presented to Queen Mary by the Maharanee of Patiala on behalf of the Ladies of India to mark the first visit to India by a British Queen-Empress. At the Queen’s suggestion, it was designed to match her other emerald jewellery created for the Delhi Durbar. In 1912 Garrards slightly altered the necklace, making the existing emerald pendant detachable and adding a second detachable diamond pendant. This is an 8.8 carats (1,760 mg) marquise diamond known as Cullinan VII, one of the nine numbered stones cut from the Cullinan Diamond. The necklace was inherited by the Queen in 1953 and has been worn by the Duchess of Cornwall at a state banquet where she met the Norwegian Royal Family. During the Durbar, the Gaekwar of Baroda, Maharajah Sayajirao III caused a stir during the presentation of princes when he approached the royal couple without his jewellery on, and after a simple bow turned his back to them when leaving. His action was interpreted at the time as a sign of dissent to British rule. 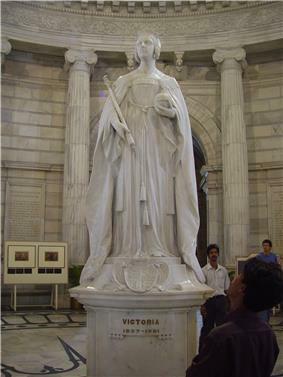 King George V announced the movement of the capital of India from Calcutta to New Delhi during the Durbar and also laid the foundation stone of New Delhi. Generally the Durbar achieved its purpose of cementing support for British rule among the ruling princes, as was demonstrated by the support given during the First World War. Twenty-six thousand eight hundred (26,800) Delhi Durbar Silver Medals of 1911 were awarded to the men and officers of the British and Indian Armies who participated in the event. A hundred and two were also struck in gold, a hundred of which were for award to Indian princely rulers and the highest ranking government officers. Ex. Lt. Ahmad ud-Daulah Khan Sardar Bahadur, Khan Bahadur, I.O.M, O.B.I,I.M,D. Khillat, Sword of Honour,Sanads Holder,Jagirdar & Hon’y Magistrate Specially presented by H.E. the C in C to his most Imperial Majesty. 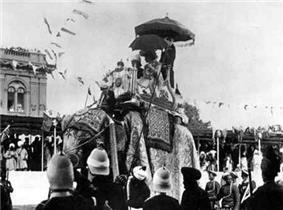 George V King & Emperor of India under Royal Invitation, at Delhi Durbar 1911. While Indian National Congress passed a motion weeks after his accession calling for a boycott of any such visit, and in February 1937 Communist MP Willie Gallacher decried expenditure on such festivities in a country of such poverty. The King's Speech of October 1937 included "I am looking forward with interest and pleasure to the time when it will be possible for Me to visit My Indian Empire", to the satisfaction of Sir Hugh O'Neill. However, the onset of World War II and the movement towards Indian independence meant this visit never happened. ^ Nayar, Pramod K. (2012). Colonial Voices: The Discourses of Empire. John Wiley & Sons. p. 94. ^ Holmes Richard, "Sahib: The British Soldier in India 1750-1914". HARPERCOLLINS. 571 pages. ^ Presidentofindia.nic.in. "Museum and Galleries in Rashtrapati Bhavan". Retrieved 15 May 2012. Supplement to Who's Who in India - Containing lives and photographs of the recipients of honours on 12th December 1911. Newul Kishore Press, Lucknow. 1912.